3,286,488 square miles. 209 million people. 5 regions. 150 languages and dialects. Occupying roughly half of South America, Brazil is so vast that its geopolitical diversity verges on the incomprehensible. Yet, if you ask people what images spring to mind when they think of this sprawling country, there’s likely to be some synchronicity in their answers. Among them might be the towering figure of Christ the Redeemer statue atop Mount Corcovado, the fragmented yellow tiles of Selarón Steps, Salvador’s pastel-toned facades, or the jubilant street parties of Rio during Carnival. Like colourful calling cards, these motifs have become emblematic of a country where there is far more to discover. 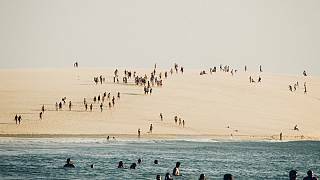 Beyond Brazil’s well-trodden backpacker trail lies the lesser-known state of Ceará. Situated on the northeastern tip of the country, its geographic makeup is a contrasting mix of jagged rust-red cliffs, a mountainous interior and 570 kilometres of gold sand coastline. An offbeat location has saved the state from the clutches of mainstream tourism, though its shores have long been favoured by kitesurfers thanks to its pristine beaches and the wind that sweeps in from the Atlantic. With its rolling sand dunes, lagoons, salt rivers and peaceful beach resorts, Ceará is the serene yin to the hot, humming yang of cities like Rio and Sao Paulo. Sustainability plays a major role in the region’s identity too, with solar farms and pylons that harness that all-powerful Atlantic wind, along with increasingly eco-aware resorts that work to preserve the surrounding landscape and support its communities. Read on for Living it’s pick of the most authentic resorts and experiences Ceará has to offer. Soundtracked by the lapping waves of kitesurfing hotspot Guajiru beach and located in the municipality of Trairi, this ocean-facing sanctuary offers its guests a different pace of life. With just 22 accommodations including suites, bungalows and villas, the site is intimate and secluded, its interconnecting pathways fringed with dense tropical foliage to give a feeling of privacy. The décor draws influence from India and Bali as well as Brazil – think beautiful hand-carved wooden furniture, stained glass lanterns and blue and white tiling – while outside, an azure pool flanked by deep-cushion loungers and shady daybeds offers jaw-dropping views of the rolling surf, palms and swaying hammocks beyond. Rooms are rendered in warm ochre tones and appointed with elegant wood and rattan furniture, giant comfy beds and sun-dappled balconies. The bathrooms are a highlight with their rain showers, deep tubs and simple flower-motif details. In the ocean-facing restaurant, guests can enjoy a slap-up Brazilian breakfast (try the tapioca pancake) and an Indian-inspired evening menu of authentically spiced share-style dishes. On top of its Brazilian good looks, Zorah Beach has some impressive sustainability commitments, including a solar-heated water system, local staff force, responsibly sourced kitchen produce and plans to move to 100% renewable energy in 2019. Inclusive packages are a no-go for Zorah – guests are encouraged to explore the local area, such as the tiny local village of Guajiru, with its colourful shops flanking a quiet central square. Located on kitesurfer-favourite Prea Beach, 30 minutes from the backpacker town of Jericoacoara, Rancho do Peixe marries beach bohemia with home comforts. Our shack-style bungalow is spacious and airy with an enormous canopy bed, inviting cushioned alcoves, plenty of storage space, and a shower room stocked with locally-made coconut and papaya toiletries. Bold tropical-print soft furnishings add a splash of colour to cool white fabrics, while wooden shutters open to reveal a gorgeous sea vista. Guests can swim in the palm framed pool, sip cocktails at the lively sea-facing bar and pizzeria, or enjoy an upscale tasting menu in the pretty restaurant, served below swaying hanging lanterns. Herbs, salad and assorted veggies are grown onsite in the kitchen garden, while tapioca is sourced from a small local mill which preserves traditional production methods. Anything that can’t be grown on site is sourced from local independent producers, and leftover food supplies are donated to local schools. Sustainability is central to Rancho’s identity. Thanks to a major overhaul in August 2018 by São Paulo recycling initiative Recicleiros, the site is close to being zero waste, with the exception of select cans and plastics. All furniture is made onsite too, using locally felled trees and driftwood. Solar panels will be introduced in 2019. Room rates per night for doubles from €110. Looking down onto the white sands of Black Barro Beach in the city of Aquiraz, where wild horses can sometimes be seen making their way over the rock pools and up into the surrounding dunes, Carmel Charme Resort draws in a stylish crowd with its luxurious take on the Ceará experience. Immaculately landscaped gardens dotted with palms and hammocks slope gently down to the beach below, and in the midst lies the expansive pool, with shallows for kids and a hot tub and wet bar for adults. There’s also a clay tennis court, fitness centre, and – best of all – a spa offering blissful Caudalie treatments. Accommodations are split between suites, duplexes and bungalows. The premium suite is clean and contemporary in style, opening out onto a private pool-facing terrace accessorised with a hammock and comfy rattan furniture. Warm wood finishes and white yarn bedsheets are offset by colourful accents, such as the azure side table with its adjoining wall panel. High spec fixtures and fittings include an HD TV, king size bed, retro fridge and coffee machine. Behind Carmel Charme’s style, there’s plenty of substance too. Among the resort’s sustainability commitments are the use of solar panels to convert solar energy to thermal, a green roof to control humidity, and the selling of its kitchen oil to a recycling company, which allows the value collected to be converted into benefits for employees. Room rates start at €305 per night for a Superior Suite. Leave the sand dunes behind and board a catamaran for an evening cruise along the Mandau River, departing from the village of Mundaú in the municipality of Trairi. The landscape here feels quintessentially Brazilian, with calm waters bordered by mounds of dense jungle, and passengers can expect to see tangled mangroves, ruby-red crabs and schools of tiny fish in the shallows. A brisk walk up into the dunes for a chilled glass of champagne while the sun sets serves as a swish interlude before the return journey home. An exhilarating dune buggy ride along the sands of Barro Preto beach and up into the dunes is one of the best ways to experience this glorious stretch of coastline. The friendly drivers know the landscape like the back of their hand and will point out local landmarks – our route takes us past fishermen waiting patiently by the rolling surf, glassy salt lakes, rippling sea inlets dotted with sailing boats and beach shack bars. Then, we hit the dunes: a stomach-flipping ride through golden peaks and troughs before reaching the uppermost sandy crown. The views from here are staggering, a split-focus vista of arid, ridged sandscape and the fresh azure wash of the ocean. On the way back, we stop at a viewpoint overlooking a lagoon and dense jungle, where a makeshift water slide sends squealing visitors down to the waters below. For the less adventurous inclined there’s a shack selling fresh coconuts and snacks, best enjoyed in the shade of a palm tree. Get a glimpse of Ceará’s arts and crafts heritage in a white-washed courtyard in the city of Aquiraz, where a community of local lace makers sell their wares. From intricate table-runners to feminine beach dresses and delicately embroidered placemats, their creations are exquisite and subtly detailed. Time seems to slow down as you enter the square – the shop-owners, all women, sit and chat in the shade of the giant tree which shoots up from the central garden. Their lace is made by hand, using threads woven around bobbins pinned to a cushion – watching the pattern form like a spider’s web is intensely therapeutic. A gift brought from here will beat a box of chocolate Brazil nuts by a long way, and help to preserve traditional craft methods. It would be a shame to visit Ceará and not attempt the sport synonymous with its picturesque wind-whipped shores. Rancho do Kite, the partner school located at Rancho do Peixe on Preá beach, is the best place to do just that, being the largest kite school in the Americas. A trial lesson gives a thorough grounding in the key skills needed before taking to the water, including how to unpack and align your kite with the wind, steering manoeuvres and full safety procedures. This takes place on the sand and ends with some tandem manoeuvres in the shallows – beginners won’t be going near a board until their instructor is confident of their abilities, so if you want to make real progress, it’s worth booking a series of lessons. Full disclosure: kitesurfing is a challenging sport and an intensive workout. For beginners, the sheer force of the kite is daunting at first. I ache all over afterwards, not only from learning new techniques, but from tensing my shoulders out of fear, which affects my posture throughout the lesson. But I leave feeling rewarded and exhilarated, pining for the ability levels of the pros who skitter and fly across Preá foam-tipped waters like giant sea birds. A basic course at Rancho has a duration of 12h, usually completed over a period of 6 days, and is priced at R$2.640,00 (€615). Packages of less hours are available. This vibrant backpacker town a 30-minute drive from Preá beach is the most commercialised stop on our route but retains plenty of charm, its sandy side streets flanked by a hodge-podge of quirky cafes, boho-chic restaurants and stalls. At sunset, the sky flushes hot pink and twinkling fairy lights drape like hanging vines over the town. With shops and stallholders selling everything from rattan furniture to technicolour pom-pom clutches and fine jewellery, Jericoacoara is an atmospheric shopping destination. Do like the locals and unwind with a potent caipirinha sold in carts parked on the beach. Discover two destinations for price of one with TAP’s Portugal Stopover Programme, which enables passengers travelling to TAP’s long-haul destinations to stop off for up to five nights in Lisbon or Porto at no extra cost.